Having seen Agricola (featured in the Winter 2008 Gamers Alliance Report) rise to the top of the BoardGameGeek rankings soon after its English release, Uwe Rosenberg returns with another big, weighty board game with Le Havre. 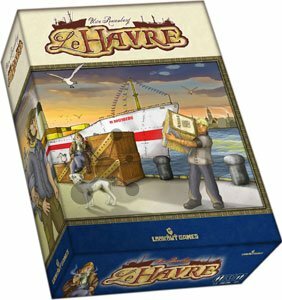 Le Havre isn’t shooting through the rankings quite so quickly – in spite ofhaving an English edition available from the get-go. 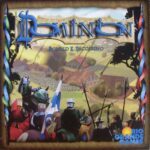 But it has been well received – already breaking into the BoardGameGeek top 40 – and while not the breakout hit of 2008 (that title going to Dominion) is still receiving significant praise. Named after the port city in Northwest France, Le Havre is themed around city development. 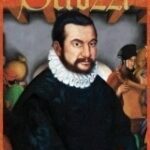 Being another worker placement game, it is frequently compared to Agricola and Caylus (Winter 2006 GA REPORT). But it is definitely a different game; the objective here is purely cash – though all buildings have a cash value. 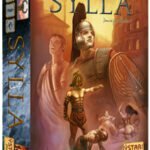 The twist here, compared to Agricola or Caylus, is that each player has a single worker – and unlike those games, a basic turn doesn’t consist of simply using a worker. 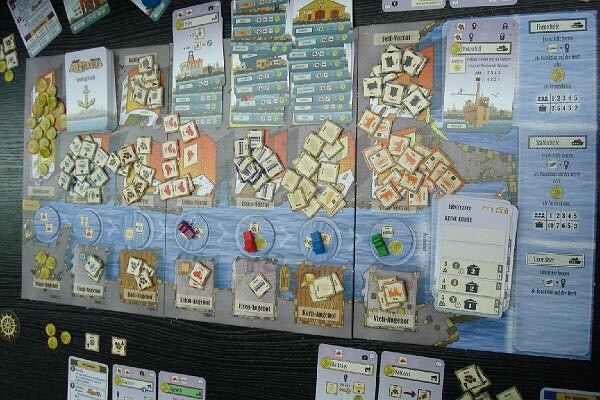 In Le Havre, each turn starts by adding two goods to the dock, and the current player then either taking all the goods of one type from the dock, or moving his worker to one of the available buildings. Initially, the only buildings available are those that allow players to build more buildings; a deck of thirty standard buildings are available, with some removed when playing with fewer than four players. As buildings are built, they become available to use; many of the buildings offer ways to earn cash. Most of these involve processing the goods – there are eight basic goods, each of which can be processed to become more valuable or more useful in some way. Once a wharf is built, players may build ships, which allow goods to be shipped for cash as soon as the shipping line becomes available. But any building which is currently occupied can not be used – even by the player currently there, who must go to some other building first before returning. To add tension to this mix, and similarly to Agricola, at the end of every seventh turn players must feed their people an ever-increasing amount of food. While building and using spiffy buildings is interesting, most of them don’t provide food (the exceptions being the bakehouse, abattoir [slaughterhouse], and grocery store); food can be purchased with cash, but if even that’s not enough players must take loans, which must later be repaid or cost dearly at the end of the game. After players feed their people, there is usually a harvest (in which an additional cow and/or grain go to players who meet the requirement), and in some rounds the town builds a building. The game continues through a fixed number of rounds, and then players get one last chance to use a building without the options being restricted by who is currently there. The player with the most points – in cash, ships, and buildings, plus end of game bonuses some buildings offer – is the winner. I have included the “cost” of a building, which is equal to the shipping value of the goods required to build the building. All buildings can, of course, be purchased; in all but five cases this is what is listed as the “value” of the building. In the cases where the cost to purchase a building is not the value, it is listed as “cost to buy”. #B1 – Building Firm (Cost: N/A; Value: 4; Use: Free; Type: Craftsman; Symbol: Hammer) – Build 1 building. One of the first buildings used – unless the Sawmill is in play – I must admit to being rather partial to this building firm ever since I saw my younger son start the game by buying it – then taking significant advantage of the symbols it provides. The symbols and low cost make it a fine choice– and one with a low cost if a cash infusion is needed later. #B2 – Building Firm (Cost: N/A; Value: 6; Use: 1 Food; Type: Craftsman; Symbol: Hammer) – Build 1 building. I’m not sure why, but I’ve never seen this used much; it seems like a very reasonable purchase option early, to ensure oneself a free way to build a building, while also making the Marketplace more effective. #B3 – Construction Firm (Cost: N/A; Value: 8; Use: 2 Food; Type: Industrial; Symbol: Hammer) – Build 1 or 2 buildings. The ability to build twice for one action is extremely powerful; of the buildings guaranteed to be available, it’s this one I’m most tempted to purchase – making it free for me is great, and I expect it to bring in a fair bit of food – and some cash, too. And I will almost certainly use the building during the game, even if I don’t own it – 2 Food for 1 action is a trade well worth making. #02 – Sawmill (Cost:: 3 (1 Clay, 1 Iron); Value: 14; Use: Free; Type: Industrial; Symbols: None) – Build 1 building requiring wood for 1 fewer wood. This is a starting building with 1, 4, or 5 players only, and is not in play with 2 players. The value/cost ratio of this building is tremendous; I’ve fallen into the habit of building it and then selling it to create some early capital, and I don’t think it’s a bad path. Not the most interesting building to hold on to, given that it’s free to use and rather popular – it’s fun to sell the building when one wishes to use it and it’s occupied, kicking off the current occupant, collecting 7 Francs, using the building – and frequently then buying a better option. #13 – Black Market (Cost: N/A; Value: 2; Use: 1 Food; Type: N/A; Symbols: None) – Take 2 tokens of each type whose offer space is empty. This is a starting building with 1 player only, and is not in play with 2 players. On occasion this is a reasonably useful building, it’s generally one I avoid, unless it’s in the way of something I want to buy or build. These building provide an alternate method for acquiring goods. Generally only basic goods can be acquired here, but some do offer limited numbers of advanced goods. #03 – Fishery (Cost: 2 (1 Wood, 1 Clay); Value: 10; Use: Free; Type: Craftsman; Symbol: Fisherman) – Take 3 Fish plus one Fish per Fisherman symbol.. The value/cost ratio of this building is very good – particularly if the Sawmill can be used to build it. Even with a couple of Fisherman symbols, I don’t find this a very useful building – but some of that has to do with the strength of loans I’m currently seeing. Not a building I’m anxious to build, but a good enough value to consider. #06 – Hardware Store (Cost: 4 (3 Wood, 1 Clay); Value: 8; Use: 1 Food; Type: Economic; Symbols: Hammer, Fisherman) – Take 1 Wood, 1 Brick, and 1 Iron. Not in play with 1 or 2 players. Can be _very_ handy when working toward building an Iron ship; not a great value/cost ratio, but useful enough to see some early action, and the symbols also help. #10 – Clay Mound (Cost: N/A; Value: 2; Use: 1 Food; Type: N/A; Symbols: None) – Take 3 Clay plus one Clay per Hammer symbol. I like this a bit better than the Black Market; if I have multiple Hammer symbols, it’s an easy purchase if available, to save the food. I usually find that the period where it’s useful is brief, however, as it’s not long before the shift towards primarily using buildings, causing the supply of Clay on offer to grow. #16 – Colliery (Cost: 4 (1 Wood, 3 Clay); Value: 10; Use: 2 Food; Type: Industrial; Symbols: None) – Take 3 Coal plus one additional Coal if you have at least one Hammer symbol. This is the reason it’s really important to have at least one Hammer symbol – more are good, due to the Clay Mound, but having at least one is absolutely necessary unless a special building offers an alternate method for acquiring it. The cost to use this building makes it worth building in spite of the relatively low value. #19 – Grocery Market (Cost: 3 (1 Wood; 1 Clay); Value: 10; Use: 1 Franc; Type: Economic; Symbols: None) – Take one each of Cattle, Fish, Grain, Meat, Smoked Fish, and Bread. Not in play with 1 or 2 players. This combination is good enough for the building to get some use, but this still isn’t one of the buildings I’m most anxious to build. Many actions in the game generate cash, but that’s all these buildings do. There are only four standard buildings in this category – but [i]most[/i] of the special buildings fall here. #04 – Joinery (Cost: 3 (3 Wood); Value: 8; Use: 1 Food; Type: Craftsman; Symbol: Hammer) – Sell 1/2/3 Wood for 5/6/7 Francs. This is one of the few ways to generate cash early in the game, and is often worth visiting once for that reason – early cash at the right time is invaluable. Later in the game, worth considering selling (gaining 4 quick Francs for no action). #11 – Arts Centre (Cost: 3 (1 Wood; 2 Clay); Value: 10; Use: 1 Food; Type: Public; Symbol: Fisherman) – Take 4 Francs per other player in your buildings. Only in play with 4 or 5 players. The amount of cash is enough as to be worth going here on occasion – a payout of 12 Francs for no goods is great. Not a very interesting building, though, to be honest, even though it is valuable. Of course, in some ways it’s better _not_ to own the Arts Centre itself. #18 – Shipping Line (Cost: 8 (2 Wood; 3 Bricks); Value: 10; Use: 2 Food; Type: Economic; Symbol: Fisherman) – Ship goods at a cost of 3 Energy per loaded ship. A critical building in the game – but not a critical one to build, save that doing so provides a single opportunity to guarantee use of the building, by selling it. Given the cost to build, purchasing the building is well worth considering. #27 – Bridge over the Seine (Cost: 6 (3 Iron); Value: 16; Use: 2 Francs; Type: N/A; Symbols: None) – Turn any number of processed goods in for 1 Franc each, and any number of basic goods in for 1 Franc per full three. Not in play with 1 or 2 players. Given the cost to use the building and the value of the building, this is a necessary component of any non-shipping strategy, and well worth considering even with a shipping strategy. The inefficiency of the Bridge is more than made up for by the lack of an energy requirement and the unlimited nature. There is one building that processes each of the eight basic goods, with exactly half generating cash as a side benefit. #05 – Bakehouse (Cost: 2 (2 Clay); Value: 8; Use: 1 Food; Type: Craftsman; Symbols: None) – Convert any number of Grain to Bread and ½ Franc, for ½ Energy each. One of the best early buildings; it’s certain to be used, but still offers good value for the cost. #07 – Charcoal Kiln (Cost: 1 (1 Clay); Value: 8; Use: Free; Type: Craftsman; Symbols: None) – Convert any number of Wood to Charcoal. Odd building – it’s extremely useful late in the game, but there’s little reason to use it when it’s built. But it’s cheap to build – it’s worth building it, and then selling it later when cash is needed. #08 – Smokehouse (Cost: 3 (2 Wood, 1 Clay); Value: 6; Use: 2 Food or 1 Franc; Type: Craftsman; Symbol: Fisherman) – Convert up to six Fish to Smoked Fish and ½ Franc for a total of 1 Energy. This can be a popular building early, so long as players are finding enough time to collect and process their fish. I once played a game where the fish were added to the offer on the final three spaces, and it took a long time before the Smokehouse was used. In my eye, it is clearly more valuable than the Fishery, and another building worth considering purchasing. #09 – Abattoir (Cost: 4 (1 Wood, 1 Clay, 1 Iron); Value: 8; Use: 2 Francs; Type: Craftsman; Symbols: None) – Convert any number of Cattle to Meat and ½ Hides. A great building to own – and cheap enough to make purchase a reasonable choice. It’s worth noting that a single trip to the hardware store – or, if holding at least one Craftsman symbol, to the Marketplace – is enough to acquire the necessary goods. This is typically one of the first buildings I look for, to develop a plan to build it. #14 – Brickworks (Cost: 5 (2 Wood; 1 Clay; 1 Iron); Value: 14; Use: 1 Food; Type: Industrial; Symbols: None) – Convert any number of Clay to Bricks and ½ Franc for ½ Energy each. The high value of this building makes it an attractive one to build, rather than purchase. #20 – Tannery (Cost: 3 (1 Wood, 1 Brick); Value: 12; Use: Free; Type: Craftsman; Symbols: None) – Convert up to four Hides to Leather and 1 Franc. I’m not sure why the limit on this building is so low; I tend to see it’s use rather limited, as a result. There’s little reason to worry about building the Tannery, though it’s inexpensive enough to consider if it’s available. #23 – Steel Mill (Cost: 12 ( 4 Brick, 2 Iron); Value: 22; Use: 2 Francs; Type: Industrial; Symbols: None) – Convert any number of Iron to Steel for 5 Energy each. Great building – the cost of using it makes is attractive, and while the value/cost ratio isn’t great the absolute difference between the two is large enough to make a difference. #35 – Cokery (Cost: 8 (2 Brick, 2 Iron); Value: 18; Use: 1 Franc; Type: Industrial; Symbols: None) – Convert any number of Coal to Coke and 1 Franc. Perhaps my favorite building, the price is reasonable, the value is great, and it’s almost guaranteed, with experienced players, that the Cokery will be used. These buildings don’t clearly fit into one of the other categories. #12 – Wharf (Cost: 8 (2 Wood, 2 Clay, 2 Iron); Value: 14; Use: 2 Food; Type: Industrial; Symbols: None) – Build one ship. A very handy building to own – being able to force its use when needed can be particularly important with two players. A good building to build (or even buy) early in the game, since it typically tends to get a fair bit of use. #15 – Local Court (Cost: 5 (3 Wood, 2 Clay); Value: 16; Use: Free; Type: Public; Symbols: None) – Return 1 to 2 loans depending upon how many are held. Not in play with 1 or 2 players. The value is critical here; the building wouldn’t be worthwhile otherwise. When holding 3+ loans, well worth considering using. #17 – Wharf – This is the same as the other wharf, but is not in play with 1 or 2 players. #21 – Business Office (Cost: 5 (4 Wood, 1 Clay); Value: 12; Use: 1 Franc; Type Economic; Symbols: Hammer, Fisherman) – Convert four goods into one Steel and additionally may convert on good into a Charcoal, Leather, or Brick. Not in play with 1 or 2 players. I would have thought this building to be well worthwhile, being a quick workaround to a steel ship that doesn’t require energy. But as a practical matter I haven’t seen it used all that much; I’m honestly not sure if that’s due to inexperienced play, or if it’s not as valuable as I’d thought. A fair choice to build, and a reasonable building to use on the way to the bank or a steel ship if iron is difficult to come by but goods aren’t. #30 – Church (Cost: 13 (5 Wood; 3 Bricks; 1 Iron); Value: 26; Use: Free; Type: Public; Symbols: None) – Convert 5 Bread and 2 Fish to 10 Bread and 5 Fish. Cannot be bought; not in play with 1 player. Primarily interesting for the value of the building; I have yet to see the ability used, though I can definitely see a good use under some circumstances. These buildings score points at the end of the game for meeting various conditions. Unlike the other buildings, the cost to buy these buildings is higher – generally much higher – than their base value. #24 – Storehouse (Cost: 6 (2 Wood, 2 Bricks); Value: 4 (Cost to Buy: 10); Use: N/A; Type: Economic; Symbol: Hammer) – At the end of the game, worth and extra ½ Franc for each good remaining. Only in play with 4 or 5 players. In some sense, a Bridge over the Seine that’s better for basic goods but worse for processed goods, but doesn’t take an action. Not the building I’m most anxious to build usually, but if I’m short on actions and long on basic goods, it’s a nice fit – and I’ll be happy to buy it rather than build. #26 – Dock (Cost: 9 (1 Wood, 2 Brick, 2 Iron); Value: 10 (Cost to Buy: 24); Use: N/A; Type: Industrial; Symbols: None) – At the end of the game, worth an extra 4 Francs for each ship. Only in play with 4 or 5 players. I don’t see 4 ships built by a player frequently enough to make the purchase price worthwhile very often, but it’s well worth aiming for if pursuing a ship-heavy strategy. It’s also likely the only reason to build wood ships late in the game. #28 – Town Hall (Cost: 10 (4 Wood, 3 Brick); Value: 6 (Cost to Buy: 30); Use: N/A; Type: Public; Symbols: None) – At the end of the game, worth an extra 4 Francs for each Public building and 2 Francs for each Craftsman building. Not in play with 1 player. The value/cost ratio is awful, but it’s a fine building anyway. The cost is high enough that it’s not worth considering for purchase – cash needs to be saved for Public and Craftsman buildings. #29 – Bank (Cost: 16 (4 Brick, 1 Steel); Value: 16 (Cost to Buy: 40); Use: N/A; Type: Economic; Symbols: None) – At the end of the game, worth an extra 3 Francs for each Industrial building and 2 Francs for each Economic building. Not in play with 1 player. One of the buildings I try to center my plan around; the high cost to purchase the building makes in nearly impossible to make pay off via that path – and extremely difficult to even manage. So having a supply of bricks and steel at the right time is critical; I will also try to have the goods for the building above the bank on hand to allow for a double build. With one exception these buildings can’t be build, only bought, so I’ve simplified the format. Since only six of these are in any game, I’ve had much less experience with these, so my thoughts here should only be taken with a larger-than-usual sized grain of salt. In my experience, most special buildings are worth purchasing – they’re usually cheap and useful. #001 – Labour Exchange (Value: 6; Use: Free; Type: Public; Symbol: Fisherman) – Take 1 Fish per Fisherman symbol and 1 Cost per Hammer symbol. This building makes a huge difference in the value of both Fisherman and particularly Hammer symbols. #002 – Bakery (Value: 6; Use: 1 Food; Type: Economic; Symbols: None) – Sell up to six Bread for 3 Francs each. A nice building early – it’s a great way to build up cash – but 3 Francs is also the shipping value, so the only thing saved is the energy. #003 – Baguette Shop (Value: 4; Use: 1 Food; Type: Economic; Symbols: None) – Sell one Bread and one Meat for 6 Francs up to four times. The need to have both goods limits the usefulness of this building, in my experience. #004 – Farm (Value: 8; Use: 1 Franc; Type: Economic; Symbol: Fisherman) – Take 2 Fish, 2 Grain, 2 Wood, 1 Hides, and 1 Cattle. Nice building to use, and nice income to encourage purchase. On the whole, well balanced, though similar in feel to the Grocery Market, making it somewhat less interesting than other special buildings. #005 – Clothing Industry (Value: 8; Use: 2 Food or 1 Franc; Type: Industrial; Symbols: None) – Sell one Hides and one Leather for 7 Francs. This is one of the better special buildings in my opinion, turning a profit and working well with a Cattle strategy. Worth buying even without such a strategy. #006 – Iron Mine & Coal Seam (Value: 6; Use: 1 Food; Type: N/A; Symbol: Hammer) – Take 2 Iron and 1 Coal. Meh – unless the hammer symbol is advantageous, this is a building that can safely be avoided. #007 – Fish Market (Value: 4; Use: 1 Food; Type: Economic; Symbol: Fisherman) – Sell up to seven Fish for 2 Francs each. A very nice building – improves the value of the Fishery significantly, and makes Fish much more interesting in the later game. #008 – Fish Restaurant (Value: 6; Use: 1 Food; Type: Economic; Symbol: Fisherman) – Sell any number of Smoked Fish for 3 Francs each. A far less useful building than the Fish Market, requiring more effort to use and effectively more limited because of the Smokehouse limitation. #009 – Fishpond and Wood (Value: 4; Use: 1 Food; Type: N/A; Symbol: Fisherman) – Take 3 Fish and 3 Wood. It’s nice to have another source for wood in the game, making this building reasonably useful. #010 – Forest Hut (Value: 4; Use: 1 Food; Type: Economic; Symbol: Fisherman) – Sell one Wood and 1 Meat for 5 Francs, up to four times. As with the Baguette Shop, requiring two different goods limits the usefulness. Here, one of the goods need not be processed, which helps a little. #011 – Plant Nursery (Value: 6; Use: 1 Food; Type: Craftsman; Symbol: Hammer) – Take 3 Francs and 4 Wood. Compare this with the Fishpond and Wood, and it’s not even close – and extra wood is great, and other than not being able to be processed the money is more valuable than the fish. Great building to buy, to – cheap Hammer symbols are hard to come by. #012 – Business Park (Value: 10 (Cost to Buy: 12); Use: N/A; Type: N/A; Symbol: Hammer) – At the end of the game, worth an extra 2 Francs for each Industrial building. Cheaper than the bank but with most of the value, this would be an automatic purchase if not for the opportunity cost – and perhaps even so. #013 – Guildhouse (Value: 4 (Cost to Buy: 8); Use: N/A; Type: Economic; Symbols: Hammer, Fisherman) – At the end of the game, worth an extra 2 Francs for each Economic building. With an extra symbol and no net additional cost as compared to the Business Park, I do consider this an automatic purchase. #014 – Harbour Watch (Value: 6; Use: 1 Food; Type: Public; Symbols: None) – Pay another player 1 Franc to remove him/her from a building, and then enter that building. Fascinating building which I don’t happen to have played with – I like it, since it prevents a strategic element – blocking – that I’m not terribly fond of. #015 – Smelter (Value: 10; Use: 2 Francs; Type: Industrial; Symbols: None) – Take one Coal, one Coke, and one Iron. Interesting building – the Coke makes it much more interesting than it otherwise would be, though this still wouldn’t be high on my list of buildings to visit. #016 – Diner (Value: 6; Use: 1 Food; Type: Economic; Symbol: Fisherman) – Sell one Wood, one Bread, and one Smoked Fish for 8 Francs, up to three times. The premium is good, but the need to have three different goods makes this awfully tough to actually use. #017 – Hunting Lodge (Value: 6; Use: 1 Food; Type: Craftsman; Symbols: Hammer, Fisherman, Fisherman) – Take 2 Hides and 3 Meat. Great, great building – worth having 6 Francs on hand to buy, if you know it’s coming up. Not bad to use either – 9 Food for one is a great deal, and the 2 Hides are a nice bonus. #018 – Coal Trader (Value: 4; Use: 1 Food; Type: Economic; Symbols: None) – Trade 1 Food for 1 Charcoal once, and 2 Food for 1 Coal any number of times. A game-changer; this makes coal available in far greater quantities than otherwise possible. If this is in the game, Cattle becomes much more important, as do Ships. #019 – Patisserie (Value: 6; Use: 1 Food; Type: Economic; Symbols: None) – Sell 1 Grain and 1 Bread for 5 Francs, up to three time. A good deal, but the limitation make this more useful in the mid-game than the end-game. #020 – Furriery (Value: 6; Use: 1 Food; Type: Craftsman; Symbols: None) – Trade any number of Hides for Bread, and sell up to two Leather for 5 Francs each. I’ve rarely seen need to get rid of Hides, so not the most interesting building. #021 – Leather Industry (Value: 8; Use: 2 Food; Type: Industrial; Symbols: None) – Trade 3 Leather and 14 Francs for 30 Francs. At first, I was more take with this – but the payoff is just good, not great, and the startup cost makes it difficult to use twice. #022 – Kiln (Value: 6; Use: 1 Food; Type: Craftsman; Symbols: None) – Process one Clay with one Energy and receive 3 Brick. Good shortcut if short of Clay, but otherwise not the most interesting. #023 – Luxury Yacht (Value: 20; Use: N/A; Type: Ship; Symbol: Fisherman) – Turn in one Iron Ship for this Yacht. Not bad – particularly if holding one of the less valuable Iron Ships – but not worth considering with a better Ship, since this reduces the usefulness of the Shipping Line. #024 – Feedlot (Value 6 (Cost to Buy: 8); Use: N/A; Type: Economic; Symbols: None) – Receive one extra Cattle at Harvest when holding 2 to 6. Not a bad building, though encouraging regular trips to the Abattoir makes it more imperative to own that building. #025 – Masons’ Guild (Value: 8 (Cost to Buy: 10); Use: N/A; Type: Craftsman; Symbol: Hammer) – Owner pays one less clay or brick for each building. Not bad – anything that works well with a building path is worth considering. #026 – Furniture Factory (Value: 8; Use: 2 Food; Type: Industrial; Symbol: Hammer) – Sell one Wood and one Leather for 6 Francs. As usual, requiring different goods take away from the usefulness – but since this building is unlimited, it’s more interesting than others to have in the game, for a single late-game visit. #027 – Town Square (Value: 6; Use: 1 Franc; Type: N/A; Symbols: None) – Take 1 different Processed Good – but no Steel – for each Craftsman building owned. Well worth using if working on a strategy that goes well with the Marketplace, obviously, but the limitation keeps this balanced. #028 – Tavern (Value: 4; Use: Free; Type: Economic; Symbol: Fisherman) – Sell one Wood and one Grain for 3 Francs up to four time. Somewhat interesting in that the goods required are basic goods – I can see using this early in the game. After than, there’s always something better to do. #029 – Haulage Firm (Value: 6; Use: 1 Food; Type: Economic; Symbols: None) – Pay 3 Francs to take all the goods from 2 adjoining offer spaces, but no Francs. Looks really interesting at first, but the number of times it’s useful seem to be small, and the cost is fairly significant. #030 – Schnaps Distillery (Value: 6; Use: 1 Food; Type: Craftsman; Symbols: None) – Sell up to four Grain for 2 Francs each. Can come in handy early, but the small amount of total cash available limits the interest later. #031 – Steelworks (Value: 8; Use: 2 Food or 1 Franc; Type: Industrial: Symbol: Hammer) – Convert 1 Iron to 2 Steel for 15 Energy. Not as big a game changer as the Coal Trader, but close; this is often the best way to build a Steel Ship early. #032 – Steakhouse (Value: 6; Use: 1 Food; Type: Economic; Symbols: None) – Sell one Meat and one Charcoal for 6 Francs, up to four times. While I like the idea, the gain isn’t great, and it can be tricky to have both goods at the same time. #033 – Wind Farm (Value: 8 (Cost to Buy: 12); Use: N/A; Type: N/A; Symbols: None) – The owner receives a discount of 3 Energy when using Energy as part of a main action. I’ve never seen this in play, but it’s another game changer – and unlike Coal Trader, is available only to the purchaser. If you know this is coming up, it’s worth saving for. If it just shows up, it’s worth selling buildings to get – particularly early in the game. #034 – Brick Manufacturer (Value: 8; Use: 2 Food; Type: Industrial; Symbol: Hammer) – Trade 3 Bricks and 10 Francs for 24 Francs. Far more interesting than the Leather Industry; Brick production isn’t limited, and the gain is twice as large, relative to the shipping value. #035 – Zoo (Value: 8; Use: 1 Franc; Type: Public; Symbol: Fisherman) – Earn 1/3 Franc per Fish and 1/3 Franc per Cattle held. I haven’t seen this building in a game, which is too bad – it’s a fun building, and seems to be reasonably balanced. Though perhaps somewhat disturbing that you can show your Cattle at the Zoo just one turn before taking them to the Abattoir. #31 – Football Stadium (Cost: 9 (1 Wood, 2 Brick, 2 Iron); Value: 24; Use: N/A; Type: Public; Symbols: None) – No building action. A very nice late victory point grab that doesn’t require Steel. In general, ships are well worth considering; not quite necessary, but nearly so; they combine with the Shipping Line to get full value out of one’s goods, and can provide the bulk of the food needed in the game. Wooden Ship (Number: 7 (6 with 3 players, 5 with 2 players, 2 with 1 player); Cost: 8 (5 Wood, 3 Energy); Value: 2-6 (Cost to Buy: 14); Capacity: 2 Goods) – Wood ships aren’t the most valuable, though they are plentiful; if you have the Energy and the Goods to use them at the Shipping Line late in the game, they do pay off. All of which makes them of some interest – but less than the better ships. Iron Ship (Number: 6 (5 with 3 players, 4 with 2 players; 2 with 1 player); Cost: 11 (4 Iron, 3 Energy); Value 2-10 (Cost to Buy: 20); Capacity: 3 Goods) – I tend to skip the first Iron Ship, but like to get a couple of the later, more valuable ones. The modernization cost isn’t a big deal, and shipping one extra good compared to a Wooden Ship is critical. Steel Ship (Number: 4 (3 with 2 players; 2 with 1 player); Cost: 19 (2 Steel, 3 Energy); Value: 10-24 (Cost to Buy: 30); Capacity: 4 Goods) – While Iron and Wooden Ships are rarely worth paying cash for, that’s not true here – the 24 Steel Ship is well worth purchasing, and the 20 Steel Ship usually is. Luxury Liner (Number: 3 (2 with 2 players; 1 with 1 player); Cost: 27 (3 Steel, 3 Energy); Value 30-38 (cannot be bought); Capacity: N/A) – the 38 value Luxury Liner is well worth planning for, but the others offer more limited value. I usually – though not always – have found that going to the Shipping Line was a preferable option. 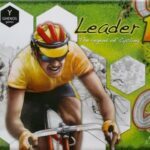 After my experience with Agricola – after my first couple of plays, I expected to see it grow to become a favorite, but instead the game faded for me – I was cautious with Le Havre. I didn’t purchase it in advance, waiting until I’d tried the game to make a choice. And I was very reluctant to move my rating up, as I had a number of concerns that could have broken the game for me; I waited to see how those would play out. But those concerns have generally played out in a way that leaves the game enjoyable for me; I still have some concerns, but they’re smaller and less critical ones. 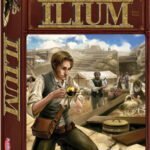 At the same time, I’ve found a number of aspects to the game which I enjoy, but which weren’t at first apparent – always a good sign for my enjoyment of a game. The first concern I had was the ability to block the wharf, particularly in a two player game where there is only a single wharf. Three things have caused me to be less concerned. The first is the ability to purchase a ship, thus avoiding any need for a wharf. The second is the fact that there’s really little incentive to sit – players tend to wait on a space for a few turns at most while collecting goods from the wharf. Finally, a player who builds the wharf has an extra out, of choosing to sell the wharf so as to free it up. The second concern I had was that a single path would prove superior. With a game as complex as Le Havre, it’s difficult to keep multiple paths balanced, but so far the game is holding up well to diverse strategies. Even more importantly, from my point of view, experience matters – I’ve generally seen the game won by the more experienced player – while a new player can generally do well enough to maintain interest in the game. I also had concern about the replayability of Le Havre; among other things, I learned the game with the shortened version, and played that a number of times before trying the full game. Fortunately, the full game adds some needed additional variability; with just 36 special buildings, there are 376,992 different combinations of 5 possible (the number relevant in a two or three player game – and, more importantly, the special buildings add enough variety to the game to make each play feel different. There are still some concerns I have about the game. The biggest currently is that the flat interest of 1 Franc, regardless of the number of loans. I missed this rule for far too long, and found that even at a cost of 1 Franc/loan, some loans could be taken advantageously. I’m hopeful that as the play style shifts towards more emphasis on loans that this will make collecting food more advantageous. I do think it will – I just haven’t seen this play out yet. I’m also am concerned about one of the special buildings, the Wind Farm. Most of the special buildings are available to anyone who wishes to use them, but the Wind Farm is only useful for the purchaser. And the power it provides – cutting the energy bill by 3 energy per building used – is very significant; I’m leaning towards removing it from the game. I’m also concerned about the balance and destructive nature of some of the bonus special buildings, but they’re easy enough to avoid by not playing with those buildings in the mix. Balancing some of these concerns, Le Havre has proven to be a game with a lot of depth to explore. In my fourth play of the game, my younger son purchased the four cost building firm – something I hadn’t seen done before, opening up a whole new line of possibilities. As I’ve played more, we’re explored selling buildings, the use of loans, and have slowed worked our way through the majority of the special buildings. For a complex game, one of the most important positive characteristics it can have is something new to do through many games, and Le Havre does just this. There are still limitations to the game. The most important, in my mind, is that for me it’s only a game for 2 or 3 players. I’m not a big fan of solitaire games anyway, and unlike Agricola, Le Havre doesn’t offer a strong solitaire scenario. 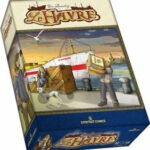 Further, for me Le Havre is what has been termed a “fixed fun” game – a game where the amount of fun is set, and is divided evenly among however many players are in the game. With 2 players, each player gets 49 actions. With 3, this drops to 42 actions, which is still plenty. With 4, it’s down to 35 actions – and each round one player will get only a single action. With 5, each player receives a mere 28 actions, and most players have to live with a single action per round. This has the advantage that a 5 player game shouldn’t be much longer than a 3 player game – but at the cost of not having nearly as much to do. Further, with more players, blockage becomes a real issue – a building will sometimes be used by one player, blocked for a couple of turns, used by another player, blocked again, and so on before a given player will have any opportunity to use it. Since turns are further apart, this means that it can take 4 rounds or more before a player will have the opportunity to use a building – which is about as much fun as it sounds. Adding it all up, I find Le Havre a very good game with 2 or 3, but not good enough to tempt me with 4 and not even worth considering with 5. That’s a small range – but, to be fair, a useful one. Le Havre is also complex enough that it’s very much a game for gamers – as contrasted with the positive reception Agricola has received as a family game. 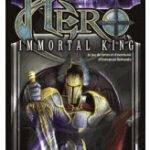 It’s also worth noting that the shortened game is a reasonable option for learning the game – but I can not recommend it as a method for playing a shorter game. The lack of special building is a minor but important issue, as there isn’t sufficient variance in the ordering of the buildings alone. A bigger issue is that the engine is too easy to get going, because of the number of goods players start the game with; this makes the game less interesting. But what really limits the game is the difficulty in getting the later buildings meaningfully utilized, as there just isn’t enough time. While learning the game, none of these is a problem – but once there, getting to the full game is called for, and there is no reason to go back. If you need a shorter game, just play with two players. As I’ve played Le Havre more and more, I’ve discovered the importance of a number of simple factors in the game. I rather enjoyed the process of discovering this information; those who prefer to find out such matters for themselves should likely skip this section. bullet Nearly every building and ship can be purchased – including the starting buildings. bullet There is no reason to partially pay off loans. The interest payment is the same regardless of the number of loans held, so a player should either pay them all off – or pay none. bullet Because food (and cash) on hand must be used in preference to taking a loan at the end of a round, fish that are intended to be smoked should not be taken late in the round unless another method of covering the food bill is available. bullet A total of 4 wood, 3 fish, 2 clay, 2 Francs, 1 cattle, 1 grain, and 1 iron are added to the offers each round. After the first round, the timing for each of these additions is known, and can be used (combined with knowledge of what is needed) to time collection of the various goods. The biggest question one must answer, in terms of forming a strategy for a game of Le Havre, is how you are going to convert your goods into cash. While there are a number of building that generate cash, that tends to be a secondary source. There are four primary sources – buildings, ships, shipping goods (via the Shipping Line), or delivering goods (via the Bridge over the Seine). There is often – but not always – a fifth option provided by one or more of the special buildings. Building ships is typically the least effective way to convert goods into victory points, and applies to a limited set of goods. However, they are necessary to ship goods, and they also contribute food, allowing for either fewer loans or for fewer actions to be spent generating food. Given this, ships might not be absolutely necessary – but I’ve yet to see a player succeed without them. The Bridge over the Seine actually challenges building ships for inefficiency – save for the fact that it’s only necessary once. Further, there are a couple of nearly ideal paths for taking advantage of the Bridge – bricks and bread. Both can be generated in unlimited quantities, and they’re worth 1 Franc each using the Bridge, in addition to ½ Franc for each one created. If there is a path that doesn’t require ships, it certainly requires either or both of these goods. Shipping goods is a fine way to generate victory points – but is inherently limited by the number of goods a player has ships for. This can be balanced by shipping the most valuable good – steel – but steel takes a lot of energy to generate, and the raw material, iron, has limited availability. I’ve therefore taken to concentrating on coke, rather than steel, as a good to ship; coal is also limited, but the transformation into coke requires no energy and in fact generates cash, not to mention the energy required to run up to three ships at the shipping line. The other good I frequently ship is cattle. Cattle are easily the most valuable of the basic goods, and further they reproduce. Among the other goods, leather is also a reasonable choice, though the limitation of the tannery often seems to leave me without enough actions to effectively ship leather. This leaves buildings, the most efficient way to convert goods into victory points. Dividing the buildings into groups of 10, there are a few key buildings to look at for creating victory points. Of the early buildings (01-10), the Sawmill and Charcoal Kiln are worth a lot of victory points relative to the goods required. The Abattoir isn’t worth as many Francs directly – but generates a lot through its use, as to a lesser extent does the Marketplace. In the middle group (11-20), the Local Court and Tannery are worth the most points relative to the goods required, while the Colliery, Shipping Line, and Wharfs have the greatest potential for bringing in business. Unfortunately, they can be paid with food – but it’s still early enough in the game for this to be useful. Personally, I’m also fond of the Brickworks. In the final group, the Steel Mill is a particular favorite – it’s expensive to build, but worth a lot, and it frequently generates good income. The Cokery is similarly valuable. But if following a building strategy, the Bank and Town Hall are almost necessary; I’ve seen the Bank score as many as 40 points in the end game. Beyond the question of where the victory points are coming from, there’s the matter of how to feed people. Initially, the only option is fish or cash – but cash is invaluable for selective purchase of key buildings, or even ships. If there are a lot of fish available, it’s worth taking them – but in general, early loans aren’t particularly troublesome. The difficulty is the question of how many loans to allow oneself; I’ve made it as high as thirteen, but at that level haven’t been able to pay them all off. I suspect that approximately eight is best. The easiest path I see to this is to not worry about feeding people early in the game – but to mix the building or purchase of ships in the mid-game with gathering enough food to avoid additional loans for a few rounds. I should note that I haven’t actually seen this work yet – but it’s definitely what I’ll be aiming for. I’m not certain as yet just where Le Havre will fit for me in the long run. It’s easily my favorite game published in 2008 of those I’ve played so far, and I enjoy it enough that I expect it to hold that title even after I get to the few games of interest that I’ve missed. The special buildings and the order in which the standard buildings come out adds enough variability to keep the game interesting from play to play. Further, there is a lot of space to explore in the game – in addition to the varied methods for accumulating Francs, there are loans and the purchase and sale of buildings, offering plenty of options to play with. 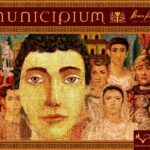 But unlike Agricola, there is enough commonality between games as to make reasonable comparisons of games – and to concentrate on exploring features rather than on dealing with the cards one has been dealt.